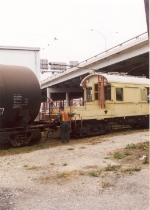 Description: Texas Transportation #2 works the switchback that leads into the brewery. Description: Crew has switched one car thru the switchback, and is going after the next. Description: #2 heads into the plant. Description: Another day, more switching. #2 comes thru the plant light. 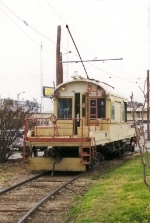 Description: TXTC was one of the last electric operated shortlines. Line lasted under wire until the brewery shut down, and #2 worked to the end.